"Geared toward problem drinkers struggling to cut back or quit drinking as well as those who want to be reinspired in recovery, this volume proposes a five-phase plan using success principles, goal setting, visualizations, neuroscience, and cognitive therapies to assist readers in identifying the reasons for drinking, defeating the dread of quitting, cultivating gratitude, and taking pleasure in confidence-building activities.... For readers who sincerely want to stop drinking the lessons n this book will pave the way." "Using positive psychology and systematic instructions …inspirational reports from folks who have beaten alcoholism…, Canfield and Andrews’s focus… is on empowering people to overcome it." 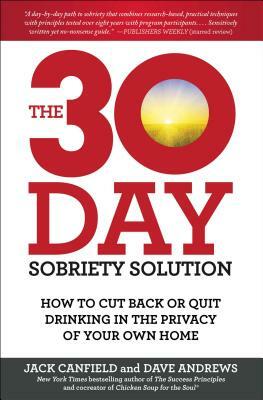 "The 30-Day Sobriety Solution is an amazing step-by-step program for getting your drinking (or any addiction) under control. It uses the latest and greatest methods for overcoming addictions. Even if you're not ready to quit alcohol entirely, this book will help you avoid the problems associated with abusing alcohol--or any other substance. I highly recommend it."